paperless chart recorder in the market that' s easy to set up and operate. 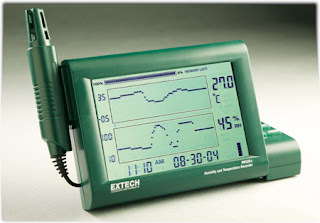 • Simultaneous numerical and graphical display of Humidity and Temperature readings, plus Time and Date. • Large dual graphical LCD displays with adjustable vertical and horizontal TAC resolution. • Internal memory records up to 49, 000 data points and can be transferred to a PC via RS-232 serial port for further data analysis.